Discrete samples (cell lines, tissues, body fluids) are labeled, barcoded, and mixed. 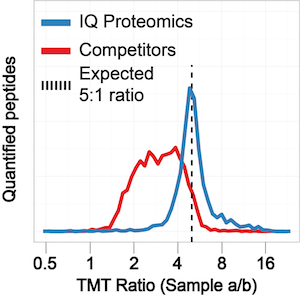 Following offline fractionation, deep mass spectrometric sequencing and quantitation yields barcode signals with intensity correlating to protein abundance. We employ state-of-the art instrumentation permitting sensitive, accurate, and precise proteome characterization. We employ methods and instrumentation that reduce the perturbation of quantitative values. This results in more accurate, more precise, and more actionable data.